Sunday I had the honor of preaching for my friend Pastor Migal Suarez who pastors the PILGRIM BAPTIST CHURCH of South Gate, CA. This is an amazing church pastored by the man of God who started it 25 years ago. The auditorium was packed with a fellowship hall filled with those watching on TV monitors. The pastor reported last night 102 saved, 84 adult visitors, and 11 baptized. He then asked those who had led people to Christ to stand and many of his dear folks stood. This church does not run buses because there is no room. They win souls and bring them in their cars to the church. This is an amazing church! Most of their visitors are adults with their children. The first 50 pastors who call 414-301-9319 and pre-register will receive free motel accommodations for Monday and Tuesday of the INDEPENDENT BAPTIST CONFERENCE which is coming to the Milwaukee, WI, area. Dr. Shelton Smith, Dr. Russell Anderson, Dr. Paul Duckett Sr., Pastor Brent Lenentine, Pastor Todd Poynter, and myself will be preaching. There will be classes starting at 9 am on Tuesday for pastors, staff, laymen, ladies, and youth. 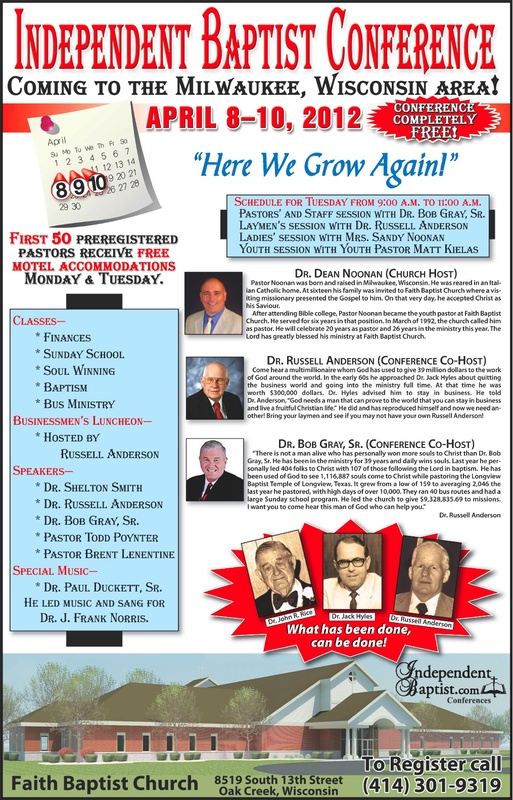 A free luncheon will be hosted by Dr. Russell Anderson on Tuesday at noon. Behind every great revival in America would be found a great man of God and behind that great man of God would be found a great layman of God. God took Dr. Russell Anderson from the coal mines of Kentucky to running 7 businesses and become a multi-millionaire businessman. He has given 39 million dollars to independent Baptist works including 8 million dollars on one day. He is 80 and will be 81 soon and we must learn the principles that God gave him before he goes to Heaven. We need more NEHEMIAHS! Please bring your laymen and allow Dr. Anderson to help them! GOTTA LOVE THE OLD TIME RELIGION!